After having been featured on releases from DJ FORMAT, this Canadian rapper steps upfront to release his debut CD on DO RIGHT! with production from DJ FORMAT and a host of guests: ELIZABETH SHEPHERD. CUT CHEMIST, DJ FASE, DJ DOPEY, YOUNG EINSTEIN (UGLY DUCKLING) and more. 15 tracks of nu skool hip hop. "A cover to cover lesson in vocal diversity from a man who attacks his tracks from every angle" Exclaim! Andy Bernstein grew up in Greektown, East End Toronto on a steady diet of skateboarding, souvlaki, art, punk rock and hip hop. Rocking the name MC Abdominal, he formed his first rap crew with the now legendary DJ Serious as a teenager, and started recording, honing his freestyle chops, building an astounding lung capacity, and developing into one of the most lyrically gifted and charismatic performers ever to grace the shores of Lake Ontario. A chance meeting in 1998 at a downtown party lead him to first cross paths with DJ Fase. The two hit it off immediately, they paired up as Abs & Fase, began recording together, and a limited run of "Vinyl Frontier" records made its way into the hot hands of DJs, radio hosts, and record collectors around the globe. One of them was picked up by UK producer DJ Format, who was floored by this unknown Canadian emcee, and invited him to England to collaborate. 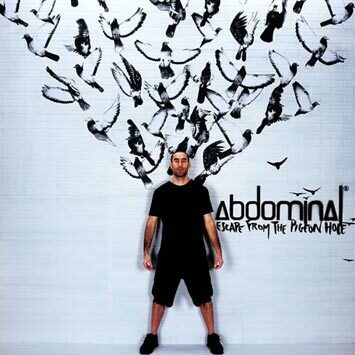 Abdominal's raps became a standout feature on Format's first two full-length releases - Music for the Mature B-Boy and If You can't Join 'Em ...Beat 'Em - selling upwards of 65,000 copies in total worldwide, and spinning off into several highly acclaimed international singles and video releases. The duo hit the road for three years, and from 2003 to 2005 they toured as part of Jurassic 5's European tour, toured with Ugly Duckling, spent a month touring Australia with the Good Vibrations Festival (alongside Lyrics Born and Handsome Boy Modeling School), opened for Roy Ayers, De La Soul and Blackalicious, and rocked the revered stages of the world famous Glastonbury Festival, Leeds Festival, and Reading Festival twice. Escape From The Pigeon Hole, the first solo record by Abdominal, featuring production by DJ Format, Cut Chemist (from Jurassic 5), Young Einstein (from Ugly Duckling), DJ Fase, DJ Serious, Circle Research, cuts by World DMC champion DJ Dopey, and a special appearance by local jazz phenom Elizabeth Shepherd, the record promises to be Abdominal's richest, most vibrant, most artistically diverse project to date. "My goal is to show a more complete picture of who I am." The tracklisting is filled with concept songs, ranging from stories about being a bike courier, open relationships, not giving a f**k, and his cat. Strong lyricism, detailed imagery, plenty of humour, and the illest of flows carry through the album beautifully, from start to finish. Abdominal is not only escaping the pigeon hole - he is leaving it far behind in his pedal-pushing dust.